What a beautiful hideous bird. Who knew that such lovely colors as purple, red and orange could look so ugly if you just paint them next to each other and throw in lots of skin wrinkles? 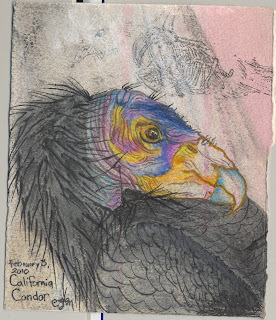 The California Condor is an amazing bird, with a six foot wing span. Endangered for many years, this species is one of our state's conservation success stories. Thanks to hard work of scientists and naturalists across the state, the condors numbers are up. Yay, more ugly birds to eat carcasses!